Yamaha Rhino Model Guide. 2003-2012 450, 660, and 700 Rhino Models. Yamaha Rhino - The original recreation side by side. The Yamaha Rhino, introduced in 2003 and continuing into 2012, blew the lid off the stodgy UTV class at the time. It redefined the UTV category by showing you could have fun and still get some work done, all with the same all terrain vehicle. We'll cover the original Rhino 660, along with the newer 700 and 450 Rhinos in this guide. What's good and bad, safety issues, what actual owners say, and even some popular accessories for these Yamaha side by sides. The Rhino 660 set off explosive growth in the UTV class by combining great off road capability with plenty of useful working utility. Nobody had seen anything like this before! Better safety, comfort, and more utility than traditional ATVs - more power, better handling, and more fun than existing side by side UTVs. "This Yamaha side by side is simply amazing in all regards. Yard work, landscaping, logging or just burning up the trails, this machine is definitely in a class all its own!" "I LOVE MY RHINO!!! Took it on the trails Sunday morning. Unbelievable! The handling and ride on the trails was so close to my Polaris Sportsman 500 I was shocked. I would recommend this vehicle to anyone." "WOW! This thing was every bit of what I was expecting and a little more. It is very responsive and powerful. It ate up the bumps as if they were not even there." "I've had mine for a couple of weeks now (just in time for deer season), and I have to say that I'll never go back to a 'four-wheeler'. It climbs hills that, on a four-wheeler, I would have to ride over the handlebars. It takes these hills with a great feeling of safety and stability. The turning radius is amazingly tight(no backing up to make those tight switchbacks). Mud and water are a joke - can't stick it! Yamaha nailed it. More off-road than utility. It's the Hillbilly Cadillac." "There was a loud rattle coming from the bed in the back that was very annoying. The lack of speedo or hour meter is something the factory needs to look at - (Not very well thought out YAMAHA !!!)" "Use belts and helmet. I flipped it twice. (yes, they are tippy) No fuel gauge. Fuel top leaks. Plastic floor boards should be steel. (I had a log bust through one and nearly got my leg)." "The power train, transmission, and main components are great, but the attention to detail is lacking." "It won't start without cranking it about 11 times. If I get the gas cap on, it takes a hammer and screwdriver to get it off." But the pros far out weigh the cons as owners give this Yamaha side by side a 4.71 out of 5 rating in a powers sports survey. The highest of any UTV side by side vehicle at that time. Most of the common problems were corrected, along with several improvements, beginning with the 2008 models. 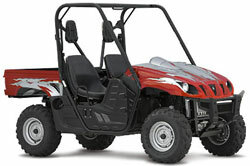 The Yamaha UTV models didn't have any earth shaking changes from 2008 to 2012. The two basic models - the Rhino 700 and Rhino 450 from 2008 were trimmed to two versions of the 700 for 2012. A lot of folks thought it was a mistake for Yamaha to drop the 450, and judging from our impressions, we would agree. But for whatever reason, the only Rhino offerings for 2012 were the standard 700 FI and a Sport Edition of the same model. There were five ways to have your Yamaha Rhino side by sides since 2009. Four variations of the 700 plus the 450 model. Like we said earlier, Rhino models for 2012 are limited to two versions of the 700. We'll start with the least expensive 450 and go up from there. Rhino 450 - Shown with one of the five new Rhino custom paint body kits. Pricey, but look how much you saved by going with the 450! For $2,200 you lose 265cc - fuel injection - and 93 pounds. Everything else about the 450 is the same as Big Brother 700. You would think that owners of the Rhino 450 would complain about the lack of power from the smaller engine. But, we found exactly the opposite. Most of them agreed there was more power on hand than they expected. A lot of them bragged they had no trouble keeping up with buddies driving bigger engined Yamaha Rhino models. Almost all the owners we surveyed felt they got a great value with the Rhino 450. In most cases it exceeded their expectations and made for some very satisfied customers with an extra $2,200 in their pockets! Rhino 700 Standard - This evolution of the side by side that changed the rules in the UTV class has turned into what we call a "Tweener". It's between sport and utility. And that's probably how most folks use them. A little work through the week and some fun on the weekend. Four-wheel disc brakes that work well, and a full size parking brake just like your car. Great Yamaha CVT transmission with dual-range (Hi/Lo) drive and reverse. This transmission just feels "right". Good response and a reputation for reliability. Three-position In/Out 4WD feature lets you switch between 2WD, limited-slip 4WD and fully locked differential 4WD - all with the simple push of a button. (Well - not that simple) you have to flip a lever to lock in the 4wd. Five-way preload-adjustable shocks. Makes it easy to maintain proper ride height depending on the weight of the load. Electronic fuel injection has better performance in nearly all conditions and elevations, along with improved cold starts. Sealed drive case keeps out water and debris, and a hand-operated side cover drain lets out what little gets in. Rack-and-pinion steering features a fully sealed steering column and double U-jointed steering linkage for smooth operation and class-leading turning radius - even in 4WD. Low-maintenance front shaft drive features gear case and electronic servo-activated 2WD/4WD/Diff Lock. Direct rear shaft drive eliminates the U-joint for greater durability. Standard center-mounted, heavy-duty 2-inch receiver-style hitch can tow over 1,200 pounds. Digital instrument panel has multifunction LCD display with speedometer, odometer, dual tripmeters, hour meter, 4WD status, transmission position, clock and fuel gauge. Underhood tool-free air filter is way easier to service. Noise reduction - New exhaust mounts, engine mounts and counter balancer. Intake is now under hood, and engine area is more sealed off. Nothing really stands out on the spec sheet, but the Rhinos just get it done better than they look on paper. The little 450 is really an overachiever. The overall driveability just makes it easier to get where you want to go. There's no substitute for years of refinement and Yamaha has taken advantage of that. 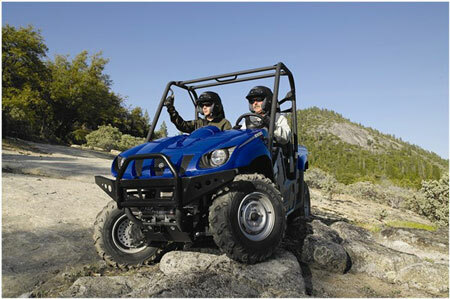 Reliability in tough conditions is better than most other UTVs. From the steering feel, the throttle response, the no-slop driveline, the strong brakes, and the absorbent suspension - all systems work harmoniously to make the Rhino more than the sum of its parts. Perfect? No - any UTV that tries to straddle the fence between sport and utility has to compromise somewhere. But our only real complaint is the locked rear diff. It just makes slow, tight going more tedious than we like. Tilt steering and more seat adjustment would really be nice! We think it's still a good choice as a multi-use sport/recreation/utility machine. 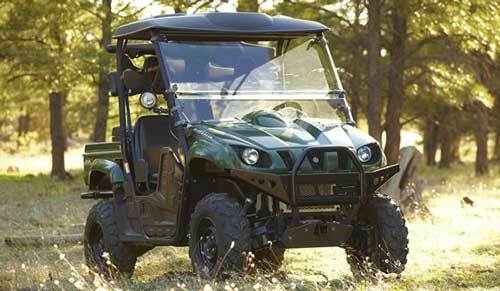 Pick one up for some of the bargain used prices we've seen and a Yamaha Rhino is tough to beat. Check out our customized links below for the best daily deals on the most popular accessories. Front and rear bumpers along with all bumper related accessories. Every kind of top from roll up canvas soft tops to aluminum and molded plastic hard tops. Windshields came in a bigger variety than you might think. There's full, half, folding, and vented, plus several combinations with multiple features. You'll find several good deals on winches, along with different mounting plates and other winch accessories. Front and rear racks of all types - at great prices! The best wheel and tires deals listed every day. Yamaha Rhinos for Sale will show you where the deals are if you're already in the market for a Yamaha side by side. Yamaha Side by Side Specifications for Rhino 450 and 700. Yamaha UTV News - Latest Yamaha Side by Side info.